I was inspired to go raw again after nearly a month of eating a bit of cooked food & mainly raw. I’m excited about shedding more ‘old stuff’, feeling cleaner & enjoying some wonderful live food. My staple for breakfast is usually a green smoothie. 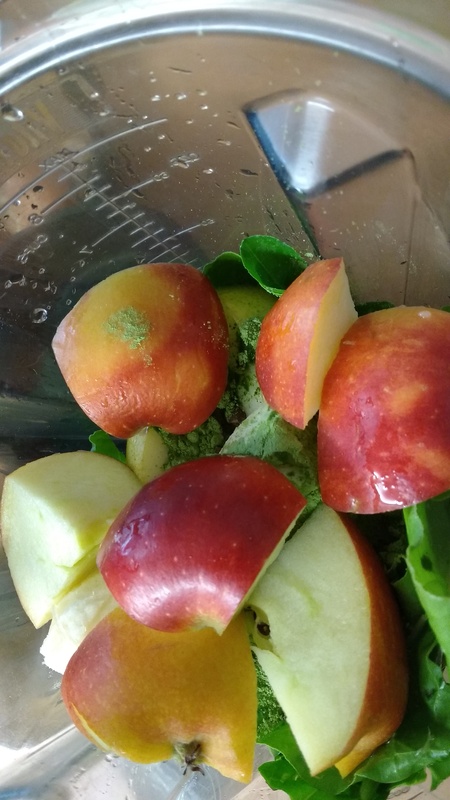 There are some beautiful apples & pears around, at this time of the year so that was the basis of my recipe this morning with spinach from the garden & raw cacoa nibs. Two of our B&B guests are interested in vegan living, one of them remarked that eating raw was so different from the way they ate or had been taught to eat as a girl. An old friend rang & said she’d been on a Raw Retreat & the lady who was running it had said that ‘eating raw is political’ anything that differs this much from the norm is making a political statement. I’d never thought of a green smoothie being political before – I would definitely vote for it in an election.